This week, Buna, a coffee roaster from Mexico City, joined us as our third roaster in residence at La Marzocco café. On Friday, July 1st from 5-8 pm please join us in welcoming Buna to Seattle. We will be celebrating with live music from Mexico’s Sotomayor, as well as with complimentary samples of mezcal, tequila, Mexican beer and authentic Mexican food, as well as the specialty coffee beverages that are part of Buna’s menu during their residency. Buna is offering three classes during their residency that are free and open to the public. The classes will be held over first three Saturdays in July at 12pm and 1pm. Please see our events calendar for more details. Buna’s cold brew made with Tun Daja–a blend with notes of chocolate–steeps for 16 hours before being served. A warm filter coffee with a splash of house made simple syrup flavored with cinnamon, orange peel and pilancillo. Pilancillo is described as crystallized molasses and has a deep sweet flavor. Buna’s cold brew with a large splash of milk. This refreshing drink combines cold brew, freshly squeezed orange juice, sparkling water and a simple syrup flavored with cinnamon, cardamom, star anise and guajillo chillies. A Buna original, this drink is equal parts cold brew and house made horchata–a sweetened rice milk drink with hints of cinnamon and vanilla. The classic mocha is elevated by Buna to include hints of cinnamon, cardamom and star anise. 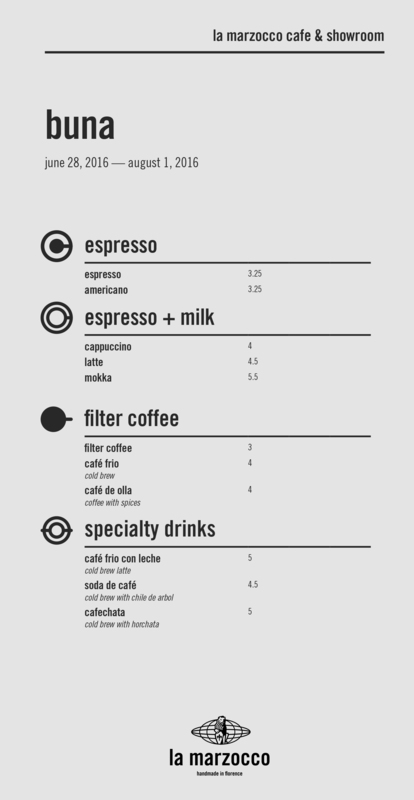 To view Buna’s full menu while at La Marzocco Cafe, head here.